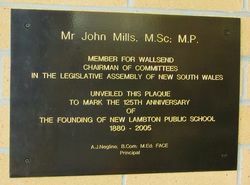 The 125th Anniversary of the founding of New Lambton School is commemorated by two plaques, one of which records its 125 years of service to the community and the major celebrations (including the erection of the anniversary gates) which were held as part of the anniversary. 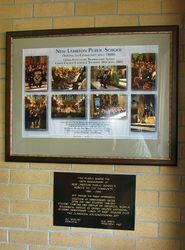 At 10.10 a.m. on 30 June 2005, the bell of Christ Church Cathedral, Newcastle, tolled 125 times to mark the 125th anniversary of the founding of New Lambton Public School. There then followed an ecumenical service of thanksgiving for the school and its service to the community since 1880. 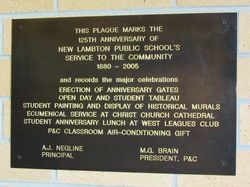 New Lambton Public School opened on March 6th, 1880 with 6 classrooms and a staff of 5. There were 270 pupils enrolled and another 100 expected. Attendance was not compulsory and fees of 3 pence had to be paid fortnightly.